GOAL: Guide and support municipalities and counties in the Compact region to create equitable climate policies, programs, and decision-making processes that consider local socioeconomic and racial inequities and ensure all can participate and prosper. As cities and counties across Southeast Florida strive to build a sustainable, resilient, and prosperous region, public policy efforts must produce benefits that are shared by all. The Compact recognizes that climate vulnerabilities are exacerbated by inequities and injustice. RCAP 2.0 seeks to address the socioeconomic challenges to building resilience in high-vulnerability communities, often limited-income communities and/or communities of color. Equity: Just and fair inclusion. The goals of equity must be to create conditions that allow all individuals and communities to reach their full potential to the benefit of the individual and the larger regional community. 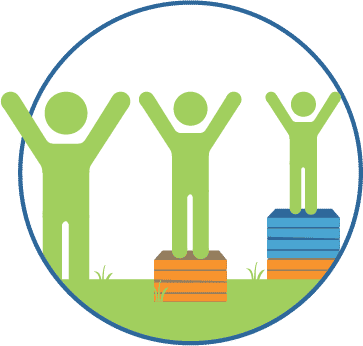 An equitable region is one in which all can participate and prosper in their communities and in the regional economy, and where benefits and burdens are shared fairly. Within Southeast Florida, individuals, neighborhoods, and communities may experience geographic vulnerability if they have proximity to a current or future hazard (e.g., if they live in a low-lying area prone to flooding or a heat island). These groups have socioeconomic vulnerability if they lack the resources, financial or other, to be able to mitigate the hazard or to move away from it. Many residents within the region’s high-vulnerability communities may have also been left behind by recent economic booms, resulting in increased challenges to achieve the financial stability needed to safely weather more intense storms, heat, and floods fueled by climate change. Equity should be an integral part of policy making at every level of government within Southeast Florida, and should be understood as a policy objective in developing plans, budgets, and in prioritizing and designing climate projects. Historically disadvantaged communities will continue to be the most vulnerable to climate change threats, unless action is taken to create targeted policies and resources. In addition, efforts to create more resilient and sustainable communities, if not designed thoughtfully, can benefit some residents while harming others. The recommendations within this section represent tangible actions that local governments can take in meeting these responsibilities. Encourage dialogue between elected officials, staff, and socially vulnerable populations about local climate impacts and community priorities to inform leaders of community needs. Integrate social vulnerability data into all local government processes. Support public infrastructure that enables economic mobility, health, and safety for all community members. Address the needs of socially vulnerable populations by engaging existing community leaders and representative organizations in decision-making processes, particularly for critical public infrastructure. Build the capacity of existing and future leaders of socially vulnerable populations to ask, analyze, and communicate about their community's climate resilience. Partner with intermediary organizations that have deep community ties with socially vulnerable populations to co-create engagement and outreach strategies. Provide equity and social justice training for local government staff.